A group of intellectuals came together from Harvard, Stanford, London School of Economics, the US Federal government, and MIT to put their heads together to study what contributes to the probability of someone becoming an inventor and an “Einstein”. Without a doubt, this is scholarly work. A few items from their research stand out, and correlate with our research. One of their 3 major lessons are that “Exposure to innovation substantially increases the chances that children become inventors.”. Indeed, the States with the highest patent rates correlate with the places where a major University system OR major Healthcare system is the largest employer. The States with the lowest patent rates – right side of graphic above – correlate with the States where Walmart is the largest employer. There is perfect alignment with this correlation, with only one exception being Fayetteville, North Carolina, which we would explain only by virtue of the fact that Fayetteville is home to “the largest military installation in the world”. This is where the world’s finest soldiers and best fighters go to train – and they are evidently not in the business of patenting inventions there. Scientific discovery is not the mission of the Army. 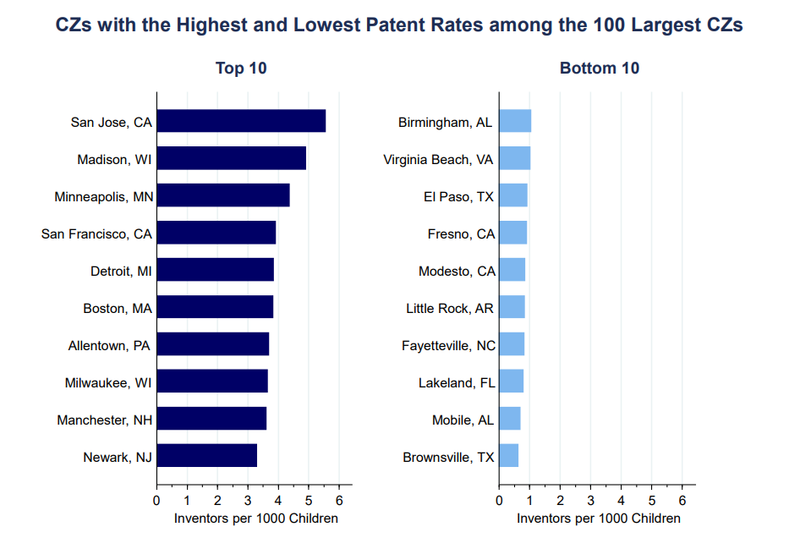 This correlation between patent rates and merely identifying what sector is the largest employer in a State might indeed support the researchers’ theory that young adults aspire to replicate the adults who they can ‘see‘ are the most successful. Conversely, in States where retail is most common, the bar for ‘excellence’ and professional success is set accordingly. This correlation might indeed justify the researchers’ conclusion on the value of “mentoring“, or might even justify other theories the researchers have cited on the value of “bowling” with others opposed to ‘bowling alone’. These are both potentially viable conclusions… until we see the rather remarkable slide displaying what is arguably the ‘only’ factor that is different explaining patent rates among equally performing 3rd graders. That factor, being simply: cash. Not mentorship. Not bowling or social networking. Mere access to CASH (especially parental cash) contributes to boosting future measurable inventiveness by more than 100%. 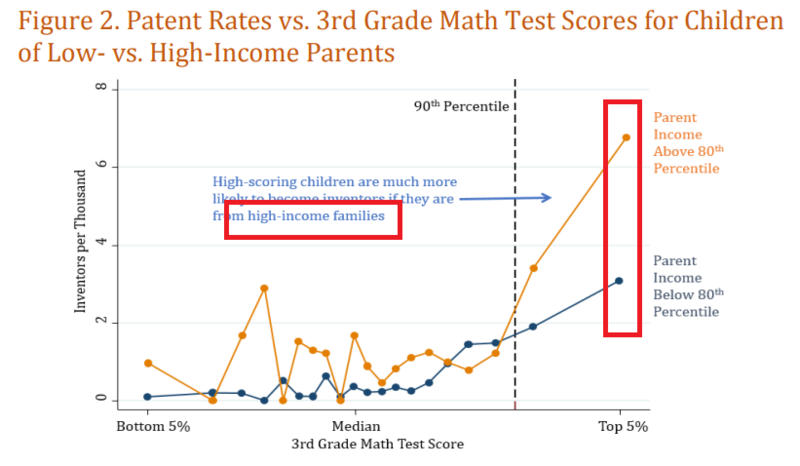 In fact, mere access to parental CASH plays such a vital role in measurable innovation (ie, patent rates), the innovation disparity by wealth of parents persists beyond elementary school and through college. 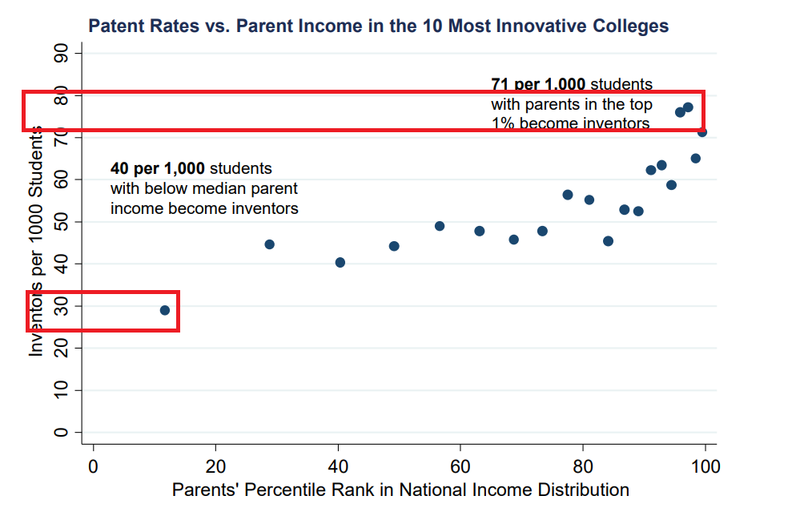 Even at the most innovative colleges (ie, a seemingly level playing field), the gap in measurable innovation is a substantial and enormous 2.5 times difference between children of parents in the highest and lowest percentiles of income earners. There is a 150% difference in measurable ‘innovation’ when sorted merely by parental access to cash, even among classmates at top colleges. Is this data suggesting that the economically disadvantaged college students at the most innovative colleges somehow were afforded lower quality college mentors than the students from HNW families? That is a very unlikely possibility. If indeed mere ‘mentorship’ produced more “innovative” people, then it could be argued that the disparity wouldn’t be the enormous 150% (2.5 fold) difference that it is, among classmates at top colleges. The subsequent question becomes… amidst and despite (1) mentorship, and (2) STEM education, and (3) pushing poor children to attain admission into top schools, and (4) going so far as to take out student debt to finance those unaffordable collegiate degrees, and (5) best efforts to assimilate and integrate and ‘bowl’ with HNW people… why is it that high performing students from low income families are still unable to attain intellectual property protections on their discoveries at the same rates as equally performing students from high income families? The researchers derived that the Innovation rate for white men from high income families ‘is about 4 times higher than in the population as a whole’. Is it possible, that HNW people are less inclined to invest into communities of people who do not look like them? Mentorship and social networking work (until they don’t). At what point do mentorship and social networking stop working, as functional solutions for economic development? We find that they peculiarly become increasingly less effective, to the degree and extent that America’s HNW families make the choice to invest no further than their offspring. In effect, the benefits of mentorship and social networking are antagonistically muted by large inheritances. This is not a condemnation against inheritances, but speaks to the seemingly measurable effect of large inheritances. We have discussed this topic numerous times with registered members… see links. Will You Perpetuate Wealth Concentration? Financial investment is still necessary to afford even simple expenditures for the inventor, such as the USPTO filing fee schedule. And in effect, the ‘Walmart Nation‘ graphic suggests that people in Southern States may not care as much about the health and education of their fellow residents as do States outside of the American South. This is further evidenced by observing which States across the country took on simple policy measures, such as expanding their Medicaid rosters when given the choice to do so, which disproportionately reduced access to healthcare services for economically disadvantaged families. With an earnest spirit to identify viable solutions for making all of America ‘great’, we begin to describe the contemporary struggles of being an economically disadvantaged scientist and inventor in America. It can be argued that economically disadvantaged people are not poorer nor are they poor inventors because of a lack of mentorship, lack of quality education, nor because they are bowling alone. Instead, there is nothing more measurably crippling to economic development than merely talented and highly trained people having a lack of access to cash; wherein, HNW families hold $50T in financial assets, big businesses hold $5T cash, and governments collect $6T cash revenues yearly. We present numerous data points throughout pH14 Plan to justify this conclusion, and we believe that this study by the fine researchers at Harvard, Stanford, London School of Economics, the US Federal Gov’t, and MIT also prove this single conclusion. A large company recently has invested into marketing a technology to measure emissions by installing sensors in the asphalt of city streets. Scientists from low wealth families could have conceptualized this technology just as easily as scientists from high net worth families. But the scientist from a high net worth family is more likely to afford the intellectual property protections, and subsequently license his invention to a large company who has the bandwidth to market and sell the technology to the many thousands of municipal, county, and State governments across the country. Scientists from low wealth families are equally capable of innovating. Merely “exposing” them to broader “social networks” is an exercise in futility, if they are not afforded the CASH to protect their inventions. We might respectfully encourage top economists to bifurcate or clarify exactly who they believe can benefit from “mentoring programs” and expanded “social networks”, or conversely, communicate more directly with HNW families on viable mechanisms for how they can safely ‘network’ (ie, meet and greet) with highly talented low wealth scientists and inventors. Within this e-learning program entitled ‘pH14 Investment Plan’, we are also developing solutions for economic development. Of note, we have acknowledged that discrimination, civil rights injustices, and race-ism do exist, and concerns about them are becoming more substantially conspicuous. However, opposed from the Harvard/Stanford/LSE/MIT approach, in our models, we are planning for its rise…. per the oft cited ‘hope for the best, plan for the worst‘ approach. Counter to their solution that recommends a lofty goal of increased integration and social networks, our model strives to be implemented in an American culture that currently is pointing to marked signs of decreased integration. Can You Afford to Wait for Inclusion? Can America truly afford to wait for HNW families to transfer their $50 trillion in cash savings to economically disadvantaged people? What if it never happens? Can America truly afford to wait for governments to change their spending habits, if the majority of the majority of voters think that everything is ‘fine’ and equitable. Is there a viable model that can be developed and implemented that does not depend upon the graciousness of a [white] benefactor in the 21st century? But are we prepared as a nation for a reality that even after investing all that time and effort, the limiting factor, being cash, may still be inaccessible. Arguably, It is not enough to identify the “lost Einsteins”. The data from the Harvard/Stanford/LSE/MIT study vividly shows that beyond identifying these geniuses and integrating them into social circles of HNW families, economically disadvantaged people with talents to help solve big problems facing humanity need to be financed with CASH (eg, contracts, grants, employee positions, philanthropic investments, ‘contributions’, etc), which only comes from a choice to invest into young people with talent from economically disadvantaged families. We’re becoming more and more convinced, that NO tax policy can encourage a HNW person to make an individual choice to invest into a highly talented individual from a low wealth family. And governments certainly can’t be depended on to invest into talented low wealth people directly, if the broader will of the electorate do not themselves seek to support these efforts. We often cite and celebrate David and Andy, who gave $100k each to Page and Brin… as a choice. No tax policy caused them to make this ‘contribution’. Morality, and economics… separately they’re powerful. Together, we believe they co-exist with synergistic potential.